They make a lovely thoughtful jewellery gift for someone special as you can choose the birthstone as well as the colour of the pearl. 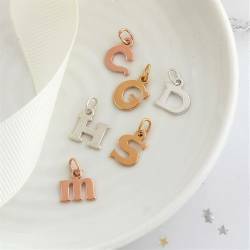 You can also add further charms with her initial and there is also an option to add a Zodiac star sign charm. You will find the full range of charms in the charms section. Each letter is hand stamped and patinised (darkened) so it stands out, or we can leave it silver or gold (clean finish) for a more subtle look. We can only stamp one letter on the front of each charm. The box chain is available in 4 lengths approx 14"/35cm (childs)), 16"/40cm,18"/45cm and 20"/50cm.